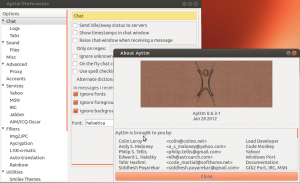 Ayttm is an instant messaging (aka chat) client that provides all-in-one chat functionality for several major instant messaging services from one simple program. Ayttm "Contacts" allow you to refer to several accounts of the same person from a single contact name, making it one of the cleanest and simplest clients to use. simple: Ayttm should work nicely without having to first go through a complicated configuration procedure. The preferences should be simple and minimal. stable: Ayttm should not crash when you use it. flexible: Ayttm supports multiple protocols and they should be supported in an integrated manner (common interface, for example), without limiting protocol-specific features support. Ayttm currently handles Yahoo!, MSN, Jabber, IRC, AIM and ICQ. 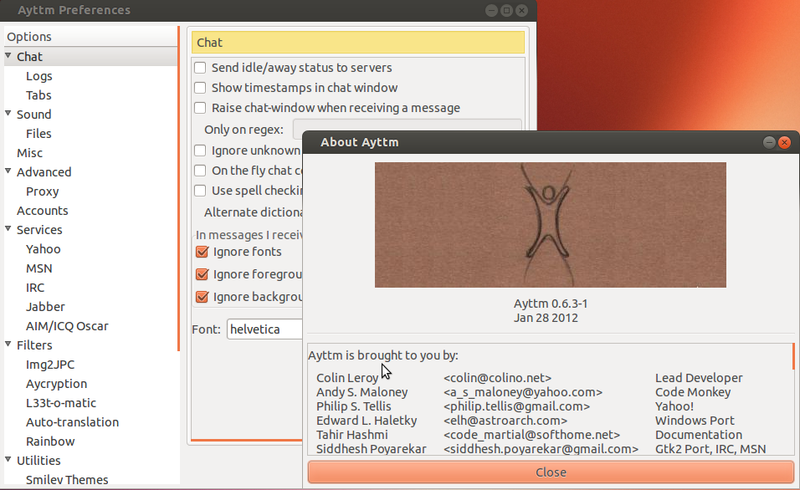 Ayttm is developed primarily for Linux but it is also available on BSD and Windows NT/2000 platforms. See the Download page for details. Protocol Transparency -- one buddy, one chat window, multiple accounts on multiple IM systems! Smiley themes need to be untarred into ayttm's smileys directory. This may be /usr/share/ayttm/smileys or /usr/local/share/ayttm/smileys. The new themes will be loaded when ayttm next starts. If ayttm is already running, simply reload the Smiley Themer module from the prefs window to have the new themes loaded. You may use these themes as examples to create your own smiley themes for ayttm. Smiley themes only work from ayttm version 0.3.1 and up, multiprotocol themes work from 0.3.3 and up.